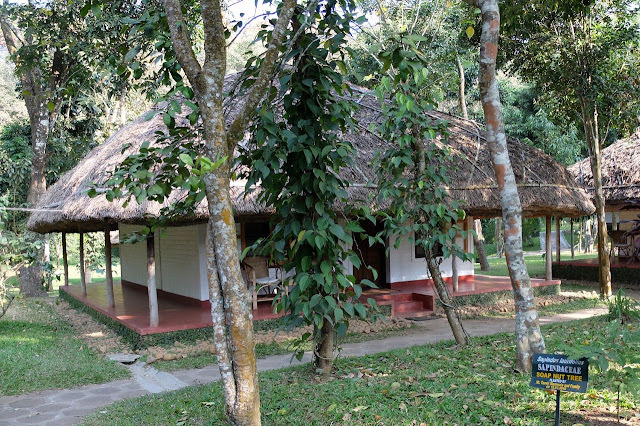 We enjoyed our overnight stay in the mountains at Thekkady in our eco friendly rustic villa with its elephant grass thatched roof (Spice Village Hotel) - a nice one night stop over on our way to Madurai. Thekkady is very close to the border of Kerala and Tamil Nadu so it seemed like no time at all (yesterday morning) before our driver had negotiated the steep decline down the mountains to the fertile valley of the state of Tamil Nadu. We had a four hour easy drive (for us as passengers) through coconut palms, rice paddies, banana plantations, fields of millet, lots of crowded chaotic towns and villages, before we arrived at the Heritage Madurai Hotel in Madurai, the second largest city (about 3 million people) of Tamil Nadu. 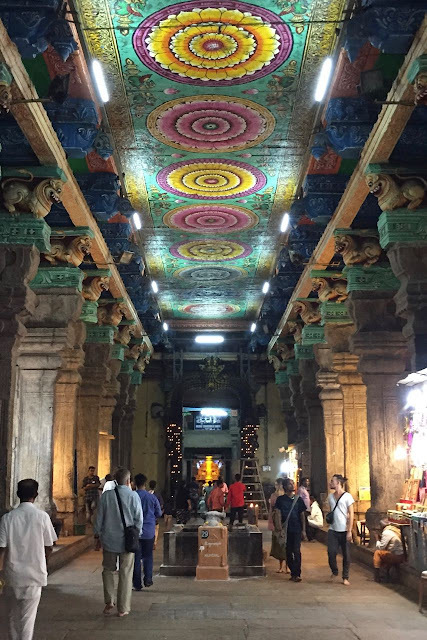 Madurai is the city of temples and jasmine, and is known as "the city that never sleeps". It has a history going back over two thousand years. One of its special wonders is the Meenakshi Temple in the city's old town. 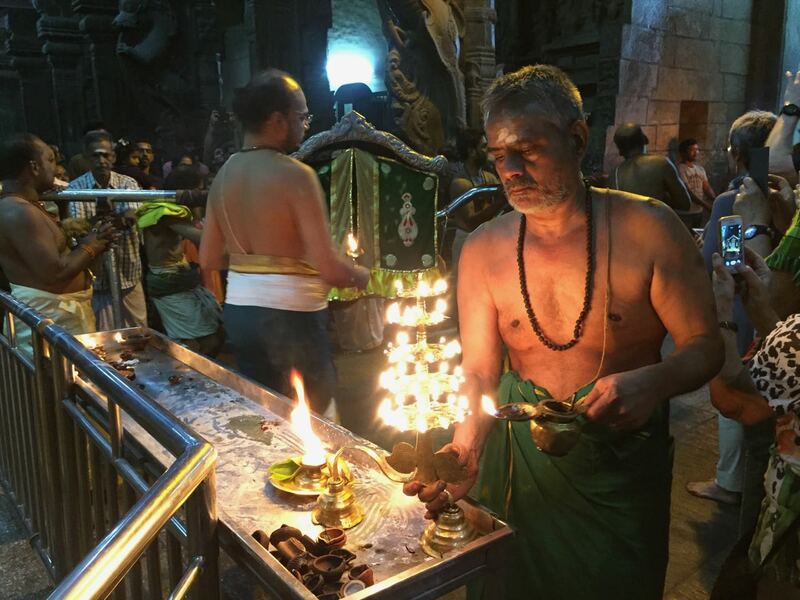 Every night there is a special ceremony where the Hindu priests take the earthly embodiment of Shiva (the destroyer) from its sacred place in the temple and place it with the solid emerald statue of his wife Meenakshi so they can spend the night together. 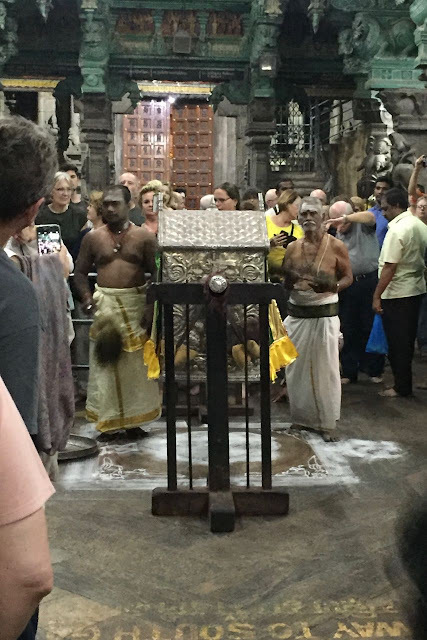 We had a guided tour of the temple for the duration of this special ceremony (no shoes, no shorts or bare arms, no cameras - but mobile phones ok). 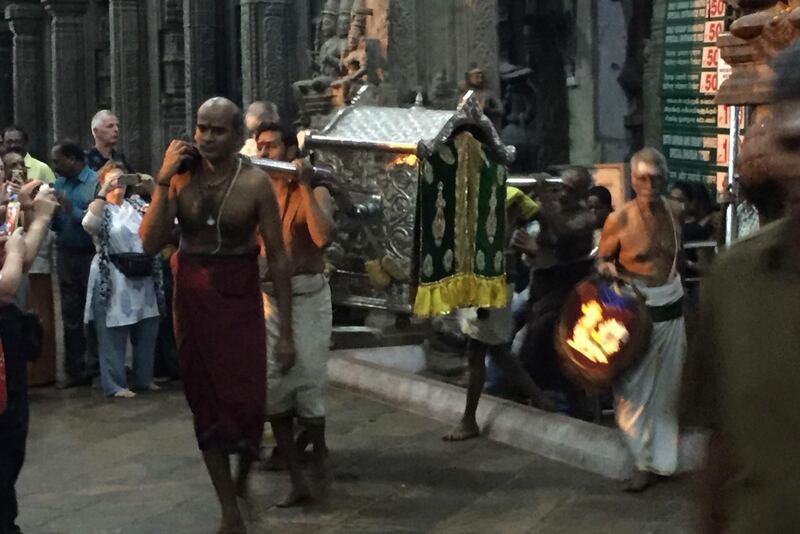 The statue of Shiva is inside this silver palanquin on its nightly journey to Meenakshi - great excitement for the excited crowds of visitors this night! 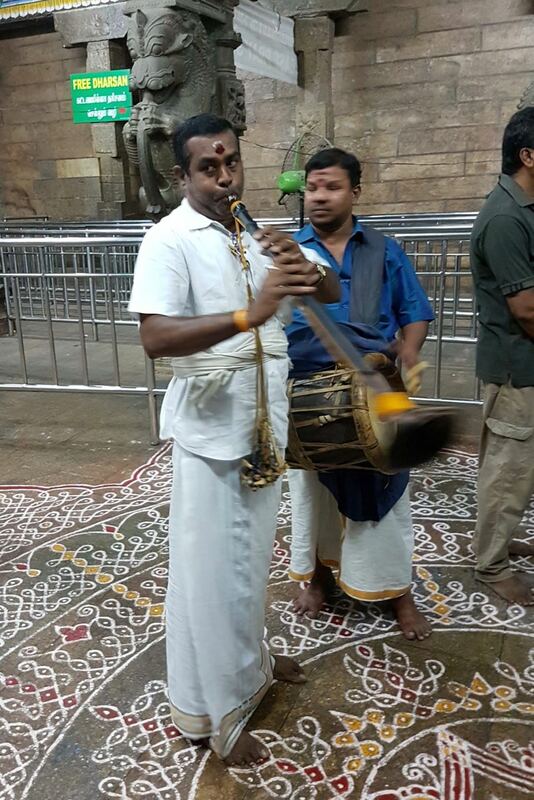 This guy made the pipe sound just like an early jazz-blues sax solo - wonderful!